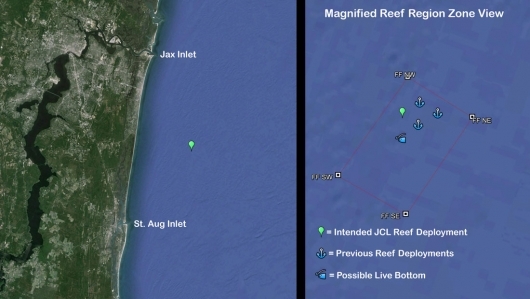 Preparations are underway to create a region of marine habitat off the coast of north Florida. By late next week the John C. Leone reef is planned to be deployed roughly 12 miles east of Ponte Vedra Beach. The reef will be constructed by placing recycled concrete materials at a predetermined offshore permitted location. 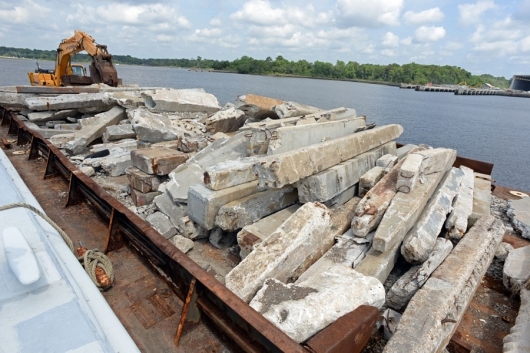 Below is an image of the material already loaded on a barge. The intended placement location is roughly 20 miles southeast of the Jacksonville Inlet and approximately 20 miles northeast of the St. Augustine Inlet. The bulls-eye drop zone is in proximity to three other artificial reefs and provides a depth of 70 feet. See the placement map below. The reefs nearby were created using similar recycled concrete materials and were deployed in 2009, 2011, and 2013. These reefs are already home to a diversity of marine life and are providing locations for fishermen and scuba divers to enjoy. Below is a clip showing some of the life encountered at these newly created reefs. We are confident the John C. Leone Reef will become a thriving underwater ecosystem that will benefit the offshore region and visitors for generations to come. The materials and deployment services are being donated by Dell Marine. What a wonderful legacy and a beautiful tribute! I’m happy to see this! Thank you to all involved. What a beautiful and everlasting tribute to John. Wow, I can’t think of a cooler way to honor and remember a true salt water enthusiast. I have a feeling that John’s family and friends, are going to have a lot of luck fishing HIS reef!!! Awesome!!!!!!!!! What a tribute to remember and continue the “Salt Life” in John’s memory. Thank you to all who made this possible. Thank you, thank you to everyone who had a role in conceiving and creating this beautiful tribute to my nephew. Our memories of John will last a lifetime, but this reef will foster life for an eternity. That is special. So nice for generations to follow to be able to experience John’s love of the sea. Maybe I will have to take up diving! This was great news, and does my heart good. John’s name will thereby be remembered forever, showing up on reef charts and GPS plotters for eons. Joe – This is Amazing !! What a wonderful tribute to John for eternity. His Family and Friends will be able to dive and fish this reef forever and it will be a peaceful place where people can feel closer to John. The addition of the 6 1/2 Ft Statue of Jesus will help put “John’s” Reef on the map as a destination for Divers in North Florida and from around the entire State and Region.